This e-mail was recently sent out by the Dan Gelber for Attorney General campaign. It is touching to see a politician stand so boldly for Equality. We need more people like this and we need Dan Gelber for Attorney General. 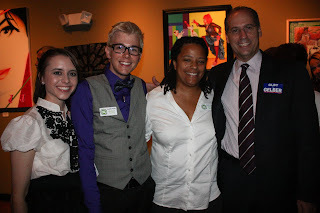 This is why, more than a year away from Election Day 2010, Equality Florida endorsed Senator Dan Gelber for Attorney General. He has already proven he will go to the mat on our issues, and we know as Attorney General he will continue to be a champion.If we want change in this state we must elect people like Dan Gelber. Read the e-mail he sent out after the jump, and help out his campaign. We need an Attorney General who will stand up against discrimination. We need an Attorney General who will fight to end the dehumanizing policies that treat Floridians unfairly. We need an Attorney General who will swing a bat every day for the rights of every Floridian. As a federal prosecutor for nearly a decade, I’ve locked people up for committing hate crimes and prosecuted those who violate the civil rights of others. In the legislature I’ve been an active advocate for human rights, fighting to end employment and adoption discrimination laws. I will eagerly do the same as Attorney General. That is why Equality Florida has endorsed my campaign: they know I will not back down from any battle.